The Travelon Anti-Theft Tote Bag is versatile enough to use as a travel or daily companion bag. The roomy compartment has a padded and fleece lined compartment to hold a laptop upto 15.6". Stay organized and protected with RFID blocking card slots, an open top wall pocket and zippered wall pockets. The handy add-a-bag panel permits the tote to slide over luggage handle, so one can move freely. The Anti-Theft features include slash-resistant construction, locking compartments, slash-resistant, locking carry straps and adjustable shoulder strap to keep the valuables protected. It is crafted in twill with leather trim and touch points with antique brass finished hardware. 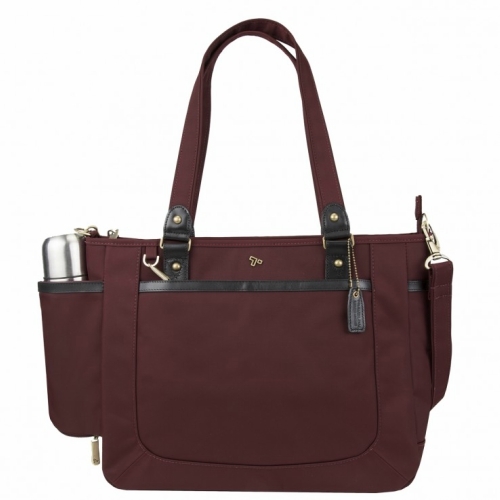 The Travelon Anti-Theft LTD Tote Bag-Wine has many exciting features for users of all types. You can extend the lifetime of your Travelon Anti-Theft LTD Tote Bag-Wine with the purchase of a FactoryOutletStore Factory Protection Plan. See the Travelon Anti-Theft LTD Tote Bag-Wine product video and gallery images above for more details. 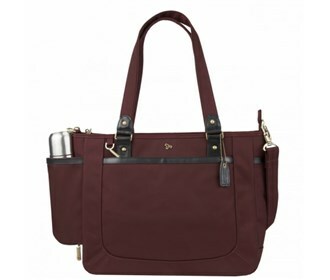 The Travelon Anti-Theft LTD Tote Bag-Wine is sold as a Brand New Unopened Item.